The Disclosures Tribunal has heard that allegations made by Superintendent David Taylor were inherently implausible and demonstrably false. Lawyer for the Irish Independent, Rossa Fanning, said the former head of the Garda Press Office unfortunately found himself in disagreement with several journalists. Mr Fanning represents Paul Williams, who has denied being briefed negatively by Supt Taylor. The tribunal is examining a claim made in a protected disclosure by Supt Taylor that former garda commissioner Martin Callinan instructed him to brief the media negatively against Sergeant Maurice McCabe. Mr Callinan denies this. Mr Fanning asked Supt Taylor if he had any explanation for why several journalists disagreed or took issue with his claims. Mr Fanning said the only rational explanation was that the superintendent's evidence was untrue in respect of all the journalists and their evidence was accurate. Supt Taylor said he did not accept that. Mr Fanning said Supt Taylor was in the unhappy situation that his evidence had no detail and that once he committed to specifics, his testimony was seen to be demonstrably false and inherently implausible. Supt Taylor said he was here to give evidence to the tribunal and his evidence was a matter for the chairman. Under questioning by RTÉ's lawyer, Sean Gillane, Supt Taylor agreed that the only two instances of alleged negative briefing he had detail on were in relation to Debbie McCann of the Irish Mail on Sunday and Eavan Murray of the Irish Sun. Both women have claimed privilege. Mr Gillane said it was curious that both names were left off the initial list supplied by Supt Taylor. Supt Taylor said that at the first opportunity he placed all the information before the tribunal. Mr Gillane suggested to him that being on the list or off the list was "something of pot luck". Supt Taylor said that was not the case. He agreed that he could not say that he had ever met RTÉ reporter John Burke. Both Mr Burke and RTÉ Crime Correspondent Paul Reynolds deny receiving negative briefings. Lawyer for three Irish Examiner journalists, Oisin Quinn, said all three were claiming privilege. Mr Justice Peter Charleton said he needed to hear factual information in relation to the claim of journalistic privilege and he said it was parked for now. Earlier, Supt Taylor told the tribunal that he made his protected disclosure because he wanted to do the right thing. Supt Taylor was asked whether he made the disclosures in September 2016 because the criminal investigation into him was "in the balance". He replied that he made the protected disclosure because he wanted to do the right thing and he did so long before matters had come to finality. Counsel for the tribunal, Diarmaid McGuinness, said that one interpretation of his meetings with a journalist and a TD was that he was trying to enlist the media and political support for a narrative that he was being unfairly targeted. Supt Taylor said he would not support that. He said he met TD Clare Daly at her request and he did not seek her out. Asked if he conveyed that he was being unfairly targeted, he said there was a robust investigation into him. Mr Justice Charleton said to Supt Taylor that if he felt the criminal investigation consisted of trumped up charges he needed to hear that. Supt Taylor said he did not deny the right of any garda commissioner to investigate a member and he accepted that. He was also asked about the conflict in evidence between himself and Sgt McCabe over whether the alleged smear campaign was conducted by text message. Supt Taylor has said it was never done by text message while Sgt McCabe said Supt Taylor told him it was done by text. Asked if Sgt McCabe had got it wrong, he said yes. "I was there. I gave the full facts as I knew it because I was there," he said. Supt Taylor has rejected suggestions that he was attempting to orchestrate newspaper stories and "light the match" to get negative publicity about Sgt McCabe. Supt Taylor told the tribunal that in speaking to journalists about Sgt McCabe, he was hoping to draw their attention to a narrative in relation to his motivation and where it stemmed from. He said how the journalists took that forward was their choice. Mr McGuiness put to Supt Taylor that he attempted to point some journalists northwards to Cavan and to the home of Ms D, who made an allegation against Sgt McCabe in 2006, which was later dismissed by the Director of Public Prosecutions. It was also put to Supt Taylor that he furnished journalists with information about the allegation against Sgt McCabe. Supt Taylor said he never directed any journalists to go to Ms D's home, and he did not know the intimate details of the allegation. The tribunal has been hearing evidence in relation to contact Supt Taylor had with two journalists, Ms McCann and Ms Murray in 2014. The two journalists are claiming privilege in relation to their contact with Supt Taylor. The tribunal has heard that both journalists visited Ms D’s family home. Supt Taylor was questioned about why he did not include the two women's names on an initial list of he provided to the tribunal of journalists who he claimed he briefed negatively about Sgt McCabe, or in his original statement to the inquiry. Supt Taylor later named the two women in an interview with tribunal investigators in September 2017. Tribunal lawyers asked Supt Taylor if he had been perhaps attempting to conceal his or their involvement by omitting the names originally. Supt Taylor denied this, and said he did reveal it following the interview with tribunal investigators. Under cross-examination by lawyers for Sgt McCabe, Supt Taylor was asked if he believed what he claimed to have been told by Mr Callinan in 2013 that Sgt McCabe was motivated by revenge. Supt Taylor said he had believed what Mr Callinan had told him that Sgt McCabe was motivated by revenge and that this arose out of a sexual abuse allegation against the sergeant and the handling of that. Supt Taylor said he now knew that the claim that Sgt McCabe was motivated by revenge was not true. Supt Taylor said that at the time he alleges he was instructed to brief negatively against Sgt McCabe, he did not believe what he was doing was wrong, and he believed he was giving out factual information. Counsel for Sgt McCabe, Michael McDowell, questioned Supt Taylor about Sgt McCabe’s account in his protected disclosure of what he had told Mr McCabe during a conversation in 2016. The tribunal heard that Sgt McCabe said that Supt Taylor had told him he believed he was being targeted because he knew too much in relation to the alleged smear campaign. 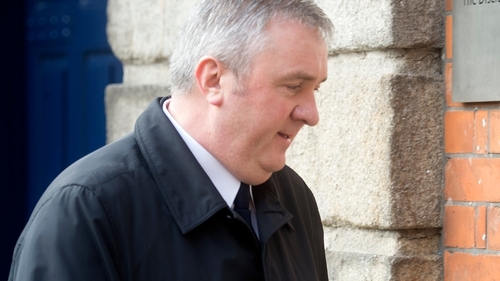 Supt Taylor told the tribunal that he never knew about the conversation between Mr Callinan and Fianna Fáil TD John McGuinness about Sgt McCabe in a hotel car park in January 2014, and did not discuss that with Sgt McCabe. The tribunal heard that Sgt McCabe stated in his protected disclosure that Supt Taylor told him that Nóirín O’Sullivan was "the pusher" in relation to the campaign to discredit the sergeant. Supt Taylor said he did not say that. Supt Taylor was questioned again about Sgt McCabe’s account that he told him he carried out negative briefing by text messages. Supt Taylor denied saying this to Sgt McCabe. He said he had told Sgt McCabe that he sent hundreds of text messages to Mr Callinan and Ms O’Sullivan about him but that these related to general updates and not to negative briefing. Supt Taylor said that he had apologised to Sgt McCabe about his part in the alleged smear campaign during their meeting in 2016, and that he apologised again today. Mr McDowell questioned Supt Taylor about Sgt McCabe’s account that the superintendent had told him there were a number of intelligence files on the sergeant in Garda Headquarters. Supt Taylor said he had believed there was a possibility that there had been a file in the Crime and Security section of Garda Headquarters on Sgt McCabe and he had told Sgt McCabe that it was a possibility. Supt Taylor again rejected suggestions that he had deliberately excluded the names of Ms McCann and Ms Murray from a list of journalists provided to the tribunal, who he claimed to have briefed negatively against Sgt McCabe. Supt Taylor was questioned about his awareness of Mr Callinan allegedly using the term "kiddie fiddler" in reference to Sgt McCabe after a public accounts committee meeting in January 2014. It was put to Supt Taylor that the exclusion of this reference from his protected disclosure was probably motivated by a desire to protect Mr Callinan, and to increase the focus on Ms O’Sullivan. Supt Taylor denied this and said he had brought the matter to the tribunal’s attention in a statement. Anthony Thuillier, Counsel for the Irish Daily Star Journalist Michael O'Toole, put it to Supt Taylor that there was no traces in the Journalist's articles of negative briefing against Sgt McCabe that the superintendent alleges he gave to him. Mr O'Toole is claiming privilege in relation to his contact with Supt Taylor. The journalist has said he did not receive any negative briefing on Sgt McCabe and that nobody in any position of authority in the gardaí smeared Sgt McCabe to him. Supt Taylor said that he had brought information to Mr O'Toole and how Mr O'Toole processed that information was a matter for his professional opinion. Mr Thuillier said that if there was a smear campaign run by Supt Taylor it was spectacularly unsuccessful. Mr Justice Charleton said it was very hard to come across anything negative about Sgt McCabe in the media, and asked Supt Taylor if the alleged negative briefing had been a flop? Supt Taylor said he accepted that. Lawyers for the former Garda Commissioners, Mr Callinan and Ms O'Sullivan, questioned Supt Taylor repeatedly about details of instances when he alleges he gave negative briefings to journalists about Sgt McCabe. The Tribunal heard Supt Taylor could not give precise dates and times. Counsel for Mr Callinan and Ms O'Sullivan, Mícheál O'Higgins, asked Supt Taylor how he knew he could discuss the alleged smear campaign Ms O'Sullivan after he claims to have received instructions from Mr Callinan to carry it out. Supt Taylor told the Tribunal he kept the then Deputy Commissioner O'Sullivan informed of all matters. The Supt has told the Tribunal that Ms O'Sullivan was aware of the alleged smear campaign. Before Supt Taylor began giving his evidence this morning the tribunal heard from lawyers for the Irish Examiner journalist Juno McEnroe. Counsel for Mr McEnroe said that his client’s instructions were that he was not denying that he had been briefed negatively by Supt Taylor against Sgt McCabe. Yesterday, it was put to Supt Taylor during his evidence that Mr McEnroe was one of a number of journalists who had denied that he had been negatively briefed. However, his lawyers said today that his statement to the tribunal indicated he was claiming privilege in relation to his contact with Supt Taylor, and that he had not denied receiving a briefing. Juno McEnroe is due to give evidence to the tribunal at a later date.